Besides the popular dive sites in front our house door we are surrounded by more fantastic spots. Our castle lays in the middle of the best dive destinations in Bali and we're able to reach them with minimized action. - Kubu, Seraya, Secret Rocks and Batu Ringit in 5-10 min. 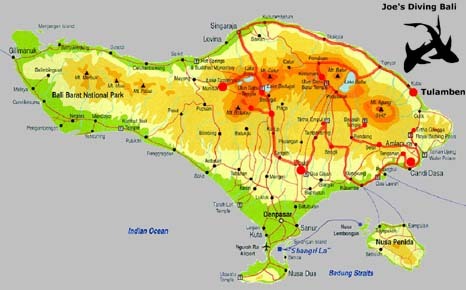 - Amed, Bunutan, Gili Selang, Lipah Bay and Gili Biaha in 20-30 min. - Tepekong and Mimpang in Candidasa in 45 min. - Blue Lagoon in Padang Bay in 55 min. - Padang Bay* to Nusa Penida Manta Point with the boat in 45 min. That's why we do dive safaris only to the north west of the island. If you want to dive the spots there we will stay overnight in Permuteran which is 15 min. away from the dive sites. We do safaris only with a minimum of 2 persons . All transfers by bus or boat, standard rooms with warm water and AC and breakfast are included. We also start island excursions from the dive castle in Tulamben. We have different routes for you available, so you will get all famous attractions of the island in front of your eyes. Whether rice terraces, water gardens, temples, volcanoes and its lakes, from waterfalls to hot springs, for everybody something will be there. If you would like to make a shopping tour we know the fitting markets where you will get the things for a decent price. You can join different ceremonies and celebrations which thrills you insight the habits of the Balinese. Bali lures with an astonishing landscape and an interesting culture and mystical places, where "the world of the people meets the empire of the gods and the restless souls".